We all need some chicken wings in our life this summer…and I’ve got the stickiest, sweetest orange chili sauce for them to take a dip in. My method of making chicken wings is straightforward: bake the wings, start the sauce, fry the wings, coat the wings in the sauce. 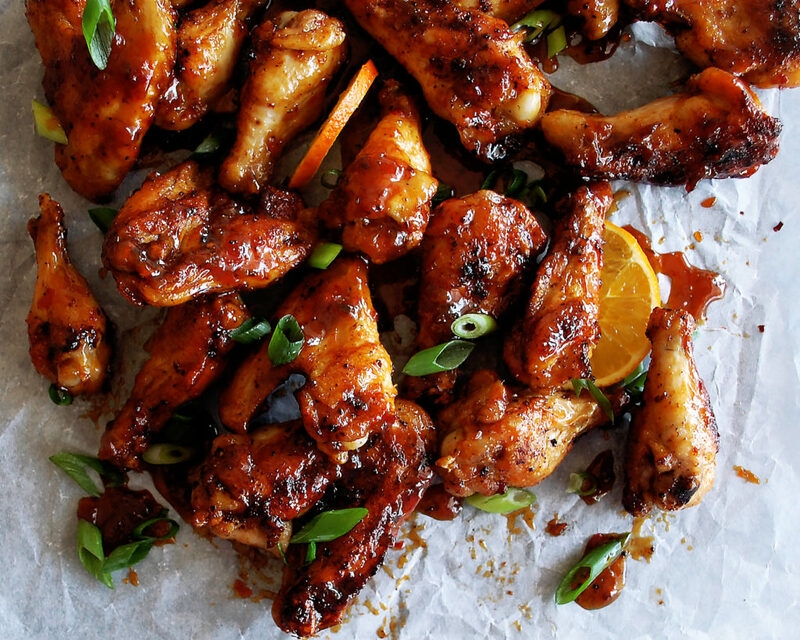 You can bake the wings ahead of time, too, which makes these perfect for entertaining. Just bake them off and completely cool them. Store them in the fridge overnight and fry them the next day. For the sauce, I knew we needed something that was sweet, kind of spicy, and definitely sticky. I mean, wings are supposed to be a little messy, right?! 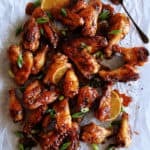 I reduced orange juice, honey, and chili paste down into an addicting sauce that gets generously tossed with the hot wings until they are dripping with saucy goodness. Trust me, you will LOVE these. 1. Preheat the oven to 400F. 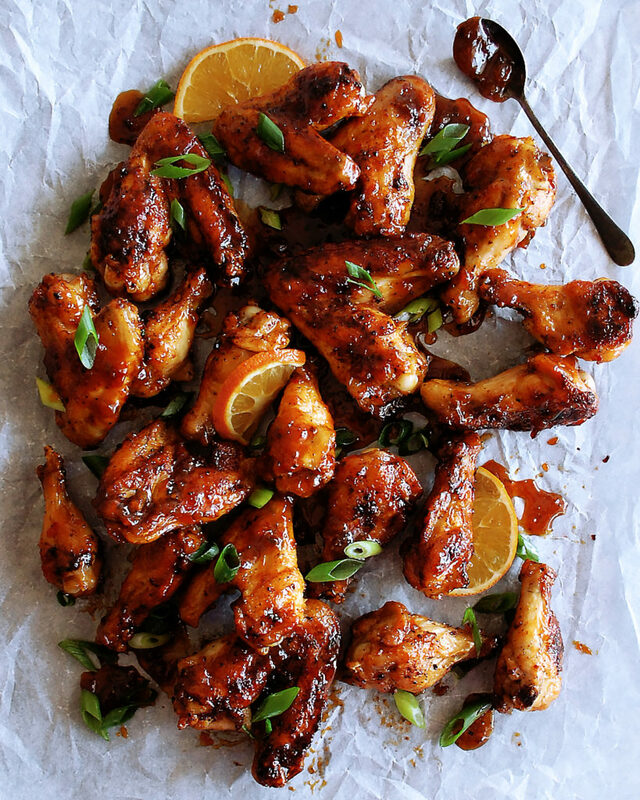 Spread the chicken wings out onto a foil-lined baking sheet. Drizzle enough oil over top to coat the wings well and season them with a sprinkle of salt. Evenly distribute the garlic powder and Korean chili flakes over the wings. Toss well. 2. Spread the wings back out onto the baking sheet in an even layer. Bake the wings for 10 minutes. 3. Start the sauce by combining the orange juice, water, honey, and red chili paste in a saucepan over medium-high heat. Bring the mixture to a boil. Reduce the heat to a simmer and let cook until thickened. 4. Fill a shallow, heavy-bottom pot with oil about ½ way to the top. Heat over medium heat until the oil reaches 350F. 5. When done, remove the wings from the oven. Cool slightly. 6. Working in batches, fry the wings until golden and crisp. Use a slotted spoon to transfer the wings to a paper-towel lined tray. Once some of the oil has soaked into the paper towels, immediately transfer the wings to a large mixing bowl. 7. Pour the sauce into the mixing bowl and toss until the wings are fully coated. 8. Garnish the wings with sliced green onions.